Black currants are small, dark red and purple berries, so darkly colored they may actually appear black, hence their name. Juicy and sweet, with a slightly tart aftertaste, black currants are often used to make jams, jellies and preserves. But they can also be eaten fresh and processed to make fresh black currant juice. A 2-cup serving of fresh black currants makes a 1/2 cup of black currant juice. 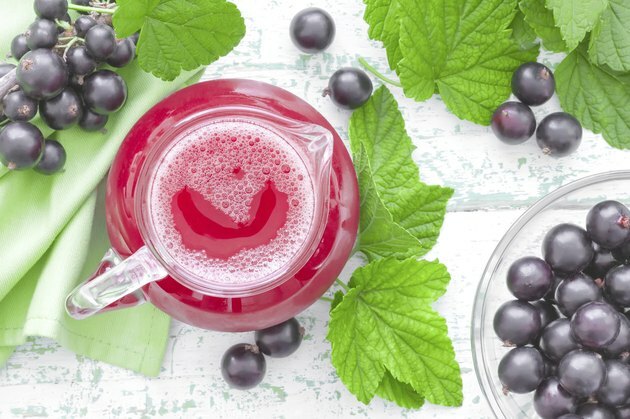 Nutrient- and antioxidant-rich, black currant juice is a tasty and sweet treat. Vitamin C is a natural antioxidant, protecting your body's cells from damage caused by environmental toxins, such as exhaust fumes. The vitamin also shields your body from free radicals produced by when your body digests food. Essential for the production of collagen, vitamin C helps form skin, cartilage, ligaments, blood vessels and tendons. It is also required for healing wounds and for keeping your bones and teeth healthy. A 1/2-cup serving of black currant juice contains a little over 405 milligrams of vitamin C. This provides well over 100 percent of the recommended daily intake of vitamin C for all adults, with a 1/2-cup serving of black currant juice containing between 3.8 and 5.4 times more than the RDI. As an electrolyte, potassium is responsible for regulating your heart's electrical activity and keeping the acid-base balance in check. It is also needed for smooth muscle contraction, so it is essential for healthy digestion and good muscle function. The adequate intake of potassium each day is 4,700 milligrams for all adults, although the amount rises to 5,100 milligrams for women who are breast-feeding. A 1/2-cup serving of black currant juice contains 721 milligrams of potassium, which is a little over 15 percent of what's considered the adequate intake for adult men and women, including pregnant women, and a little over 14 percent of the adequate intake for breast-feeding women. A mineral that is found throughout your entire body, iron is needed to make your blood cells. It also helps produce oxygen-bearing proteins — hemoglobin and myoglobin — and forms many parts of various proteins throughout your body. Adult men and women over 51 require 8 milligrams of iron a day, while women 50 years old and younger require 18 milligrams per day. A serving of black currant juice has 3.45 milligrams of iron, providing almost half of the requirement for women over 50 and adult men. It provides 19 percent of the requirement for women 50 and younger. Anthocyanins are the flavonoid compounds that give black currants their rich, deep, dark color. A natural antioxidant, anthocyanins not only protect your body's cells from damage -- like all antioxidants -- but they may also play a strong role in increasing visual ability and reduce the growth of cancer cells, reduce the risk of cardiovascular disease and help with treating neurodegenerative disorders, particularly those related with age.